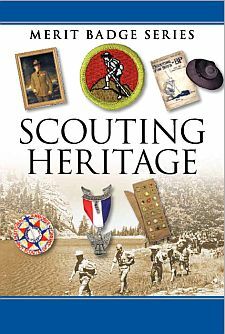 Give a short biographical summary of any TWO of the following, and tell of their roles in how Scouting developed and grew in the United States. Write or visit the National Scouting Museum. Obtain information about this facility. Give a short report on what you think the role of this museum is in the Scouting program. Learn about the history of your unit or Scouting in your area. Interview at least two people (one from the past and one from the present) associated with your troop. These individuals could be adult unit leaders, Scouts, troop committee members, or representatives of your troop's chartered organization. Find out when your unit was originally chartered. Create a report of your findings on the history of your troop, and present it to your patrol or troop or at a court of honor, and then add it to the troop's library. This presentation could be in the form of an oral/written report, an exhibit, a scrapbook, or a computer presentation such as a slide show. Reproduce the equipment for an old-time Scouting game such as those played at Brownsea Island. You may find one on your own (with your counselor's approval), or pick one from the Scouting Heritage merit badge pamphlet. Teach and play the game with other Scouts. Scouts must include the following information: first and last name, current Scout rank and their mailing address. Parents or leaders should verify that the Scout's information appears legible and is accurate; A number of letters every year are received where the Scout's information isn't legible or is inaccurate. Then, wait for a response. A letter, which will also answer any questions the Scout might have asked during the inquiry. The letter may feature the National Scouting Museum – Philmont Scout Ranch passport stamp and date. Scouts should feel free to ask a question about BSA history, the museum itself or Philmont. The idea is to do more than merely write, "I'm working on Scouting Heritage merit badge, please send information." Don't use the National Scouting Museum Facebook page to make a request. Stick to email or snail mail. If Scouts write a letter, make sure it is legible - especially the return address. Remember that the visit, letter or email is the first step of requirement 4b. The second is to "give a short report on what you think the role of this museum is in the Scouting program." Scouts should allow at least three weeks for a response. Information will not be sent to counselors or Scoutmasters, only to Scouts working on the merit badge. Scouts send in more than 1,000 letters every year (in 2013, that accounted for 28 percent of all Scouts who earned this MB), and while the museum staff strives to send information within three weeks, there are times when that is not possible.